Johnson: All of these people have left and, in Mike Tyson’s case continue to make, an important and positive mark in the world. They have all inspired millions of people and all have become cultural icons. Janis is no different as she was and is a significant force in our cultural and social conscience. I met with Michael and Laura Joplin at the office of the manager of the Estate in October 2010. We had an extraordinary four-hour conversation about Janis, growing up with Janis, her influences and what proved to be an insight into the private world of Janis Joplin. When I learned that at an early age she read, she painted, listened to Broadway cast albums and that her choices in her own music came from a personal truth influenced by some of the greatest blues singers of our time. I was astonished. I left that meeting, went home, shut off cable TV and I immersed myself in the words, music and writings of Janis Joplin. Three weeks later I woke up at 3 am in the morning knowing exactly what the show should be. It would be set in the context of a Joplin concert one week before the recording of the “Pearl Album.” I wanted the audiences to know and experience Janis Joplin the artist, the person, where she came from, the influences that shaped her and how she got there. Six months later 20,000 people had already seen the show. Three years to the day I after I began writing "A Night With Janis Joplin" opened on Broadway. RJ: As both the playwright and director, how do you shape a show like this so it has dramatic tension? Johnson: The musical is really a blues-rock opera. The words, the lyrics merge as one to tell the story. It’s a musical set in the framework of a “concert.” The entire piece tells Janis’s story and journey in words, music, art and influences. RJ: One item that people constantly mention about the show is how much it references the great blues singers, the women who influenced Janis Joplin. Why did you think that had to be part of the evening? Johnson: When I discovered the impact of these blues singers on the life of Janis Joplin that reminded me that we are all a product of our influences. What came before us shapes us as individuals. These influences are really our mentors even if we haven’t met them. Janis had some extraordinary “mentors” and has gone on to shape the lives and thoughts of generations who come to know her through her music, words and art. RJ: What did you discover in the course of researching this show that you think even the biggest Joplin fan will be moved to learn? Johnson: What continues to touch me is the heart and soul of Janis. She had a quiet and gentle kindness and she continues to teach and inspire me every time I mount a new production. 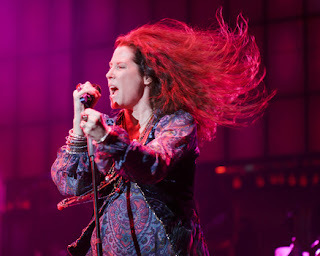 “A Night with Janis Joplin” plays at the 5th Avenue Theater through April 17. The cast is headlined by Kacee Clanton, who played Janis in the recent Broadway production of the show. Kristin Piacentile plays Janis in alternating performances. For further information, see the 5th’s website.